We’ve all heard the saying that breakfast is the most important meal of the day. Well I definitely agree! How you start off your morning sets the tone for your entire day. What you choose to put in your body determines how much energy you’ll have and how smooth your digestive processes will be. If you grab something quick, filled with sugar and on the go, you may feel anxious and “on the go” for the rest of the day. If you don’t start off with any breakfast, you may feel weak with no energy, and end up starving and completely gorging yourself later in the evening. If you start off your morning with a loaded nutritious meal, you will feel nourished and energized for the rest of the day. In America, typically breakfast is the smallest meal of the day, lunch is medium sized, and dinner tends to be the largest. In other countries, breakfast is celebrated as the largest meal of the day, lunch is medium sized and dinner is the smallest. To me, it makes perfect sense to start your day with a sensible breakfast, in order to get your energy going so you can accomplish whatever tasks are set for you throughout the day. As the evening comes and it becomes time to wind down, why would you overload your system with a huge explosive meal? Especially right when you are about to go to sleep? I refuse to eat late at night right before going to sleep, because then I just feel like a big lump in bed. My body doesn’t have an opportunity to maximize all the energy from the foods I’ve just eaten, instead it just lays there. Of course, we all don’t have the luxury to make a nice meal for ourselves in the morning. Some of us have work, school or errands to run right away in the morning. However, taking that extra 5 minutes to prepare something for yourself really will make a huge effect on your day. One of my favorite things to eat in the morning are veggies and eggs. You heard me. Straight up veggies. To bite into a piece of broccoli or yam first in the morning is so feel-good and delicious. Here is a recipe of a recent breakfast I had last week. 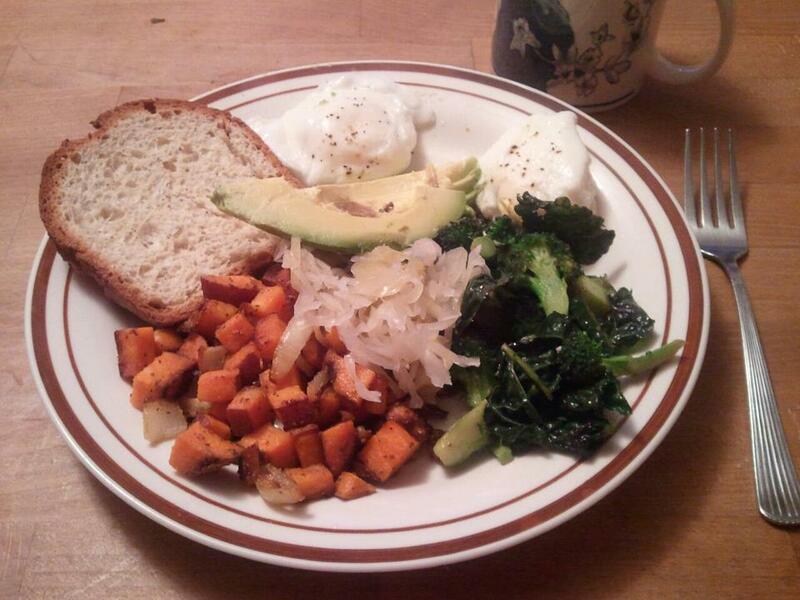 Poached eggs, cajun kale & broccoli, cumin seasoned sweet yams, avocado, sauerkraut, and gluten free toast. Saute onion in olive oil. Add cumin and stir to create flavor base. Add diced yams. In separate pan, saute minced garlic in olive oil. Add turmeric and stir to create flavor base. Add broccoli and kale. Poach your eggs: Fill a pan with water. Heat on high until boiling. Crack eggs in water. Reduce to medium heat. Let eggs simmer for 2 minutes, then with a spoon, slowly flip your eggs to simmer the other side. Remove from water, salt and pepper to taste. Toast your bread. (I use fresh gluten free bread from the Great Harvest Bakery or the Udi’s brand). Cut your avocado in half, pit out the seed. Slice a few pieces on your plate. Scoop out a few spoonfuls of sauerkraut. Dark, hearty greens are a fantastic way to start off your morning. Loaded with calcium (more than milk) and tons of nutrients (too many to name). Poached eggs are great because you don’t have to use any oil or butter to cook them, they cook themselves in water. I choose gluten free bread, because it makes me feel better. The gluten in regular wheat bread is what gives you the “expansive” feeling. If I have too much, I literally feel like my tummy is expanding. Avocados are “good fats,” and high in Vitamin E (good for the skin). One day, I would like to make my own sauerkraut. However, for now I buy the Bubbies brand from PCC Natural Markets. Fermented foods are fantastic for the digestive system, filled with pro-biotics and “good bacteria.” Also a great yeast-reducer.